Pedro, more than 4 donators and practically all players of EU3 server can confirm that u can perm ban players, change map, make players jump and set them on fire!!! Shame on you liar!!! Shame!!! Well you funny guys ….it the same as i say to talek , Elm and termi for fun to vote ban kahazadar and you vote ban him ….so make does im then a Donator ? think About it …..
You are done Pedro. Why you are making it worse for you. Why you just dont tell the truth....? We have proves that you have permissions like admin. Players and donators know you, they know you can perm ban. You have permanently ban Feyye, donators can ban for 30 minutes or 1 hour. You banned him. And i am repeating what i have wrote - you can set players on fire, you can make them jump very high. We have players who can confirm everything what we have wrote. At least you are a rasist and you are offending players. n'essaye pas de deriver sur un autre sujet. le probleme vient de seulement de toi pedro, ton racisme et ton comportement avec tes pouvoirs d'admin que tu n'a jamais ete soi disant...que tu soi nostalgique du 3eme reich c'est ton probleme! ce que tu a fait n'est pas digne d'un joueur ou d'un admin , tu merite le ban perm pedro. je sais que tu va repondre a ce post parce que ton ego te le commande, traduit ca t'occupera. Here is the list of our admins. Pedro is not on the list. Also in regards to the racism and bad language - I have always said that what gets posted in chat is fair game. It's the internet. If you can't deal with trolls or toxic people then you shouldn't be playing online games. 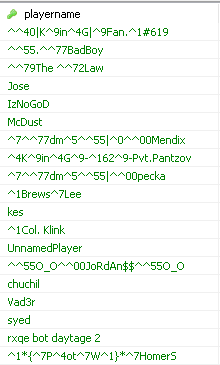 Also you can remove "UnnamedPlayer" from that list of admins who is Mayiaa. Admin abuse as recent as today. Lastly I have removed the permissions for moderators that allows them to delete forum posts/topics. If moderators want to remove content from the forum, they must move it to the new "Deleted content" sub-forum that only moderators/admins can access.